Why: Because we love our members! It’s time we celebrate you! Our members are our biggest supporters and without their support we wouldn’t be able to continue our mission. Membership fees for a year help us support our artists in residency, our education programming, and all the tours, outreach, and events we host year-round. This holiday season, we wanted to say thank you to our members. Join us on Saturday for museum tours, art-making activities, live music and more! To celebrate, current members are invited to the Mattress Factory on December 11th from 12 pm to 4 pm for a host of fun things. We will have crafts for kids of all ages, tours of our exhibitions, refreshments, live music, and special discounts (an extra 10% off in addition to your membership discount for a total of 20% off) in our MF Shop with free gift wrapping provided! In addition, every visitor can enter a raffle, and we will have a special free make-your-own t-shirt for members (while supplies last and one per person, per household)! Our North Side neighbors and friends from Artists Image Resource (AIR) will be here to help you silkscreen your own t-shirt – we have lots of sizes available, including kids' sizes and onesies! 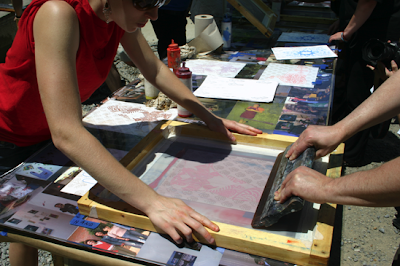 MF Members will be able to make their own silkscreened t-shirt for free! Take a moment from the holiday rush and stop by the MF on December 11th to enjoy all the perks of being a member. You deserve it. And don’t worry if you aren’t a member– you can still visit the museum and be part of the fun. if you want to join, you can do it on the spot at the museum. On Saturday only, MF Members can enjoy 20% off in the MF Shop + free gift wrapping! Again, thank you Mattress Factory Members!